Donald K. (Deke) Slayton was one of America’s original Mercury Seven astronauts. He flew on the Apollo-Soyuz Test Program, a joint U.S.-Russian space mission, in 1975. He was born in Sparta, Wis., on March 1, 1924. He received a Bachelor of Science degree in Aeronautical Engineering from the University of Minnesota in 1949, and earned honorary degrees from Carthage College in Illinois and from Michigan Technological University. He joined the Air Force in 1942 and received his wings a year later. During World War II, he flew 56 combat missions in Europe as a B-25 pilot with the 340th Bombardment Group and later joined the 319th Bombardment Group in Okinawa and flew seven combat missions over Japan, then became an aeronautical engineer with the Boeing Aircraft Company in Seattle. He was recalled to active duty in the Minnesota Air National Guard in 1951 and served with Headquarters, Twelfth Air Force, and later with the 36th Fighter Day Wing, both in Germany. He remained in the Air Force and attended the USAF Test Pilot School at Edwards Air Force Base, Calif., and then became an experimental test pilot there. Slayton was selected by NASA as one of the United States’ seven original astronauts in 1959. He was assigned to fly the second Project Mercury orbital mission, but was grounded by an irregular heart beat. He stayed with NASA to supervise the astronaut corps, first as chief of the Astronaut Office and then as director of flight crew operations. He eventually overcame his heart problem and was restored to flight status in 1972. Three years later, on July 17, 1975, Slayton made it into space after 16 years as an astronaut. He, Tom Stafford, and Vance Brand rode an Apollo capsule that linked up with a Soviet Soyuz spacecraft carrying Alexei Leonov and Valery Kubasov. They conducted joint experiments for 47 hours. Slayton, Stafford, and Brand remained in orbit for nine days. For the next two years, Slayton was manager of the space shuttle approach and landing tests at Edwards Air Force Base. From 1977, until he retired from NASA in 1982, he was manager for orbital flight tests. Slayton died of cancer at his home in League City, Tex., on June 13, 1993, at the age of 69. At the time he was president of Space Services, Inc., of Houston, a subsidiary of EER Systems Inc. The company develops rockets for suborbital and orbital launch of small commercial space payloads. 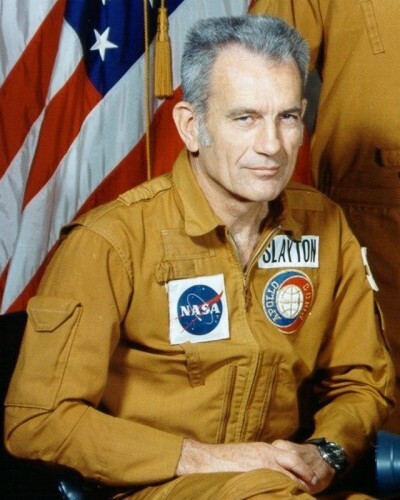 Deke Slayton was inducted into the U.S. Astronaut Hall of Fame on May 11, 1990.